Web Design entails much more than giving your site a fresh coat of paint although that is a very important part of the process. Many factors come in to play for a well designed website including SEO (Search Engine Optimization), CMS (such as WordPress), integrated blogging, social media interaction, measurement & tracking, and more. A good web design firm goes beyond the look of the site and, using advanced marketing skills, builds a complete site that brings traffic, converts customers, and is easy to maintain or update. Having a professional and up to date site will convey an appearance of success and quality while an old out of date website will lead potential customers to think you are either no longer in business or just unable to market you business. Though the overall look of the site may be the main reason for a re-design, it isn’t the only benefit. Optimizing the site during a redesign is often one of the reasons for the update and is extremely helpful in getting your site back up to where it should be on Search Engines such as Google and Yahoo. Allows you to re-focus your website to better suite your clients. During the redesign process we analyze what was lacking in the older version and make sure to make your site as profitable as possible using analytics and user tracking. Your competitors are either stagnant or they’re scrambling to update themselves. Now is the perfect opportunity to fly past them and absorb they’re market share with a fresh new look. A site redesign gives you an entirely new online presence for which to market in social networks, media campaigns and print advertisements—something you’re not only proud of but excited to introduce. Each build every site in the Word Press CMS (Content Management System) allowing you to easily manage your online content and keep it fresh and new. 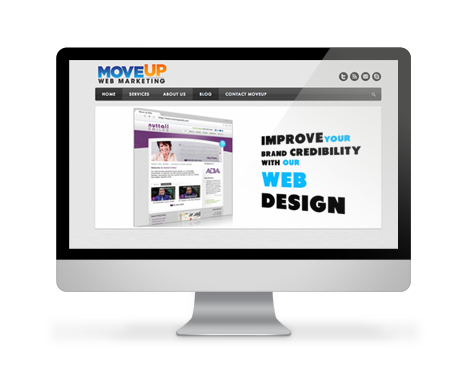 MoveUp Web Marketing offers all kinds of web design services whether you are looking for a brand new website or a web site revamp we can help. Our sites are built with SEO in mind, making it simple for search engines to find you. Our sites are built on WordPress so that they can easily be maintained. All of our sites include a built-in blog with tools to easily add new entries. We know how important it is to see results. That is why we offer a range of tools for you to measure how your site is performing. Tools like Google Analytics, contact forms and tracking phone numbers just to name a few. Social Media widgets and icons allow you to connect your social media accounts with your website.